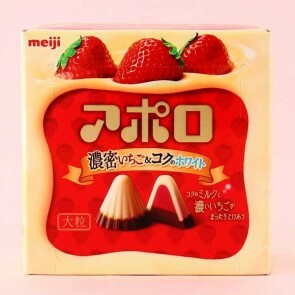 Meiji's one of most beloved delicacies for decades is the sweet Apollo chocolate. The delicious treats are shaped like the Fuji-mountain, the lower part of a mountain made from creamy milk chocolate, and the top part of the mountain is covered in fruity mousse-like strawberry flake filled pink chocolate. Absolutely delicious!